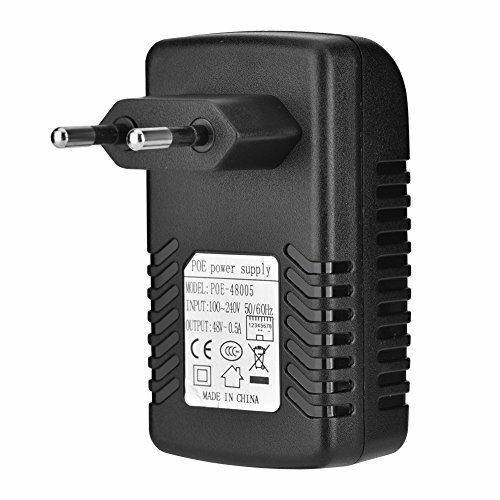 The compact, wall-mountable design makes it easy to install the adapter in seconds with no configuration required.This POE injector is a simple power supply equipment for POE or Non POE devices via only an Ethernet cable.This adapter provide short circuit, over-current, and over-voltage protection. LAN Port: Connect Network interface of Router, Switch, and mainframe computer. Applications: IP Phone, Wireless Access Point and Client Devices, etc. Portable Size:The Compact, Wall-Mountable Design Makes it Easy to Install the Adapter in Seconds with no Configuration Required.Compact, Portable Size with Convenient Wall Plug Design. Power Supply Equipment:This POE Injector is a Simple and Convenient Power Supply Equipment For POE Or NON POE Devices Via Only an Ethernet Cable, Which will Save Your Trouble about Power Line Cabling and Save Cost. Applications:Non POE Device such as IP Camera/Phone, Wireless Access Point, Security Camera Systems, Routers, Modems, Switches, Embedded Computers or Other Network Devices. POE Single Supply:International Standard POE Single Supply, in Line With IEEE802.3AF / AT Standard, The Output DC48V / 0.5A.Power Over Ethernet with 48V Power Supply, Compact Size Convenient US Wall Plug Design. Protection:This Adapter Provide Short Circuit, Over-Current, and Over-Voltage Protection.Network Connector Type is CAT-5 Unshielded Cable and Above (The Maximum Length is 100M).